In late 2009 the Afghanistan-Pakistan Hands Program was established to develop a pool of "subject matter experts" on Afghanistan and Pakistan. The program, abbreviated to "AfPak Hands", was created to fill a void - the need for individuals who knew the culture, language, history, politics, and other aspects of the Afghanistan and Pakistan region. These individuals are selected from the military and other U.S. government agencies by the Pakistan Afghanistan Coordination Cell (PACC). 12. The "hands" attend a training course in Washington, DC and then deploy for one year to Afghanistan or Pakistan. History of AfPak Hands Program. The program stood up in September 2009. One intent of the program is to have the AfPak Hands establish close working relationships with their counterparts in the respective countries. By early 2012 the first and second "cohorts" of approximately 180 individuals had completed their one year long tours in either Afghanistan or Pakistan. As of January 2012 there were approximately 700 AfPak Hands. 1. Some Afghan Hands were already re-deploying for the beginning of their second tour in Afghanistan. Management of APH Program. A number of policies and directives have been issued concerning the AfPak Hands Program. Two important documents can be found on the Joint Chiefs of Staff website on the AFPAK Hands Management Element web page. The AFPAK Management Element (AME) coordinates the assignment of APH personnel between training, in-theater, and out of theater assignments. The AME is part of the PACC located at the Joint Staff and has Human Resource experts from each service who coordinate assignments and training. Training. The initial AfPak Hands training is intensive and lasts five to seven months. Not only do they learn the language (Dari or Pashto) and culture but the AfPak Hands are expected to become familiar with many other aspects of Afghanistan and Pakistan to include customs, politics, economy, governance, development, counterinsurgency, and the military situation. In addition to the initial training in Washington, DC the 'hands' (those going to Afghanistan) also received a week of 'in-country training' COIN Training Academy located on Camp Julien, Afghanistan (near Kabul, but this may have been discontinued). 2. The Kabul Cable Blog. One source of info on the AfPak Hands program is a blog entitled "The Kabul Cable". The blog is by an Afghan Hand who deployed to Afghanistan in the later part of 2012 for his one-year long tour. You can read about his training and preparation for his tour as well as his impressions upon arrival in Afghanistan here - www.thekabulcable.com. AFPAK Alumni on Linkedin at Diplomatic Language Services. Language Training. The majority of the training the AfPak Hands receive is language training. The language training support is provided by the Defense Language Institute Foreign Language Center. 11. The initial language training is conducted at a Defense Language Institute (DLI) location in Arlington, Virginia. The languages they learn include Dari, Pashto, or Urdu. During their overseas tour in Afghanistan or Pakistan the AfPak Hands are encouraged to participate in distance learning language training. Upon completion of their first tour the AfPak Hands are provided additional post-deployment language and cultural training to prepare them for their second tour in Afghanistan or Pakistan. This can sometimes include 4-5 months of additional language sustainment training. Assignments. Many of the "hands" work at the ministry level as mentors where they interact with senior Afghan or Pakistan military or civil authorities. In Afghanistan some find themselves at provincial or district government centers where they work security, governance, and development issues. A few are found at the Provisional Reconstruction Teams (PRTs). However, in Afghanistan some find themselves working in billets in Kabul or the Regional Command hqs working in staff billets that have nothing to do with the intensive training they received - this a fault of the receiving unit that miss-utilized them. 6. Others find that their interaction with Afghan counterparts is limited. 3. One of the best uses of the AfPak Hands is their employment by Combined Forces Special Operations Component Command - Afghanistan or CFSOCC-A. 7. The great majority of the AfPak Hands assigned to CFSOCC-A are sent to work throughout Afghanistan to assist in the CFSOCC-A Village Stability Operations (VSO) program as members of a District Augmentation Team (DAT), Provincial Augmentation Team (PAT), or regional Village Stability Coordination Center (VSCC). 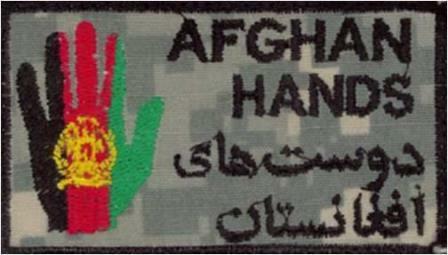 Implementation of Afghan Hands Program. The AfPak Hands program is provided guidance and oversight by the Joint Staff Pakistan Afghanistan Coordination Cell (PACC). 8. The services were directed to provide highly-qualified candidates for the program. However, the program got a slow start and initially - wasn't fully supported by the different services. 9. The Chairman of the Joint Chiefs of Staff felt it was necessary to issue additional guidance to the services to support the AfPak Hands Program. 10. Operations in Afghanistan. The members of the Afghan Hands program, at least those correctly utilized by their commanders, are provided great freedom in their movement and activities. Many do not wear uniforms in order to fit into their work environment (Afghan governmental offices and ministries). 4. If working in a Pashtun area of Afghanistan they are allowed to wear beards. Some Afghan Hands seem to have freedom of movement off the FOBs while others are trapped behind a desk at a major command headquarters (IJC, ISAF, and Regional Commands). 5. As of September 30, 2011 there were 190 AFPAK hands dispersed throughout the country of Afghanistan. 13. Continued Education. One of the strongest attributes of the program is the intent to continue to develop and educate the AfPak Hands for their next overseas assignment. Of the original "cohort" that has recently returned to the United States about 40 members are enrolled in master's degree programs; some at the National Defense University. 1. The Afpak Hands also receive several more months of language and cultural training upon their return from Afghanistan and Pakistan. Continuity. A key element of the AfPak Hands program is that upon their return to the United States these Afghan and Pakistan "experts" do not go on to other assignments where their recently gained experience is no longer used. Instead, they are assigned to billets that are in need of their newly developed knowledge. In addition to working on assignments related to Afghanistan and Pakistan while stationed in the U.S. (most likely in the D.C. area or CENTCOM in Tampa, Florida) they continue to receive cultural and language training. Members of the AfPak Hands commit to a three to four year assignment in the program; with a strong possibility of serving at least two tours in either Afghanistan or Pakistan. The Future of AfPak Hands Program. The AfPak Hands Program is an example of one of the things we have done right in Afghanistan. It is a shame it was established eight years after the start of the current conflict in Afghanistan. Just imagine how much value this program would have had if established in the winter of 2001. The military needs to stick with this program and continue to improve it. Other governmental agencies (USAID 14.) might consider a similar program. As of April 2012 there were plans to expand the working relationship of AfPak Hands with Special Operations Forces in the Village Stability Operations program as part of the transition and "stay behind" force in 2013 and 2014. 15. We will be in Afghanistan for a long time even if only in an advisory role and the members AfPak Hands Program will be playing an important role in that effort for a long time into the future. Coleman, Michael, James Gannon, Sarah Lynch and Reginald Evans, "AFPAK Hands: A Template for Long-Term Strategic Engagement? ", Small Arms Journal, May 24, 2015. The authors suggest that the AfPak Hands program is a valuable entity and should be continued under the DoS or DoD. Heffington, Steven, AFPAK to APAC Hands: Lessons Learned, posted on War on the Rocks, January 7, 2014. Mayfield, Tyrell. "Handcuffed: The Burden of Institutional, Management and Leadership Problems of the AFPAK Hands Program", Small Wars Journal, October 18, 2013. The title says it all. Stavridis, Admiral James G., U.S. Navy, "Teaching the Ropes", Proceedings Magazine, Vol. 136/5/1,287, May 2010. October 18, 2016. "Our generals failed in Afghanistan", by Jason Dempsey, Foreign Policy. Article discusses the mismanagement of the AfPak Hands program. February 11, 2014. "The Afghanistan-Pakistan Hands Program", by Maj Mark W. Lee, Army.mil. October 22, 2013. "AFPAK Hands work directly with Afghans and Pakistanis". Air Force Times. The program bridges the cultural gap between Afghans and NATO. February 26, 2012. "AF Special Ops officer killed in Kabul shooting". U.S. Air Force. One of two U.S. military killed in the Ministry of Interior (MoI) during the February 2012 Koran burning incident demonstrations was an AfPak Hand. January 28, 2012. "Move the Af-Pak Hands Out of DoD". Small Wars Journal. Major David Walker, a US Air Force officer, argues that the AfPak Hands program should be continued but under the Department of State as the lead federal agency. January 4, 2012. "AfPak Hands Program Pays Dividends in Afghanistan, Pakistan". American Forces Press Service. December 20, 2011. "AFPAK Hands have strategic effects". Defense Language Institute. November 29, 2011. "Af-Pak Hands for USAID". Center for Global Development. October 20, 2011. "AFPAK Hands Program Enhances Role of Navy Medical Personnel with Afghan Security Forces". DCmilitary.com. September 27, 2011. "DLIFLC commandant examines language mission in Afghanistan". Defense Language Institute. July 28, 2011. "AFPAK Hands make bonds stronger than steel". Army.mil. June 26, 2011. "Bridging the language gap to create a better Afghanistan". DVIDS. April 25, 2011. "First Group of Deployed AFPAK Hands Returns From Afghanistan". DoD Live. February 3, 2011. "AFPAK Hands: Developing trust in a foreign land takes sacrifice". CNIC Naval Support Activity Washington. August 1, 2010. "New programs prepare troops, civilians for language and culture found in Afghanistan, Pakistan". Association of the United States Army. May 2, 2010. "AFPAK Hands Begin Immersion Training in Afghanistan". DVIDS. May 2010. "Teaching the Ropes". By Admiral James G. Stavridis, U.S. Naval Institute. Admiral Stavridis writes about the AfPak Hands Program. January 8, 2010. "Chairman Touts Importance of Cultural Engagement". American Forces Press Service. October 25, 2009. "Marines aim to learn Afghan, Pakistani cultures". Marine Corp Times. March 2015. Resolute Support Advisor Profile Series #1, DVIDS video about an Afghan Hand, USAF Capt. Brandon L. Sanders, who is an advisor to the Ministry of Interior. (14 minutes). February 10, 2014. The Afghan Hand. NATO TV. Mel Preen narrates a short video about Colonel Steve Heffington, an Afghan Hand, who advised the Kabul former Police Chief General Salangi. April 10, 2013. Afghan Hands Orientation in Kabul. DVIDS. February 25, 2013. Afghan Hands. DVIDS. Interview with BG Don Bolduc of SOJTF-A and others about the Afghan Hands program. 1. "AfPak Hands Program Pays Dividends in Afghanistan, Pakistan", American Forces Press Service, January 4, 2012. 2. "AfPak Hands Begin Immersion Training". ISAF. This news article details the 'in-country training' that AfPak Hands receive at Camp Julien upon their arrival in Afghanistan. May 5, 2010. 3. " - - but is the AfPak Hands program flopping?" The Best Defense Blog, Foreign Policy, April 8, 2011. 4. "Afghanistan-Pakistan Hands Program Implementation Directive", HQs USFOR-A, 4 October 2010. (Acrobat Adobe PDF). Implementation directive signed by General Petraeus. 5. "The Strategic Risk versus Tactical Safety: What Happens When We Lose the COG". By Jeremy Kotkin, Small Wars Journal. An AfPak Hand provides insight into how force protection stymies mission accomplishment. 6. "Lament of an AfPak Hand: I've been abandoned and misused in Kandahar". The Best Defense Blog, Foreign Policy, July 7, 2011. A blog post detailing the miss-assignment of an AfPak Hand. 7. "AfPak Hands Strive for Cultural Awareness". American Forces Press Service, March 3, 2011. BG Miller of CFSOCC-A applauds Afghan Hands program. 8. "Afghanistan / Pakistan Hands (APH) Program", CJCSI 1620.01, 3 September 2010. (Adobe Acrobat PDF file). This Chairman of the Joint Chiefs of Staff Instruction establishes policies that govern the management of the APH Program. This document also describes the types of training and assignments of AfPak Hands. 9. "Slow Start for Military Corps in Afghanistan". The New York Times, January 5, 2010. 10. "Career Management of Afghanistan Pakistan (AFPAK) Hands Program", CJCS CM-0948-09, 14 December 2009. (Adobe Acrobat PDF file). 11. "DLIFLC plays major role in new Pentagon program", Army.mil, November 24, 2009. 12. "U.S. Devotes Unit to Afghanistan War", The Wall Street Journal, June 12, 2009. This news article briefly notes the formation of the Pakistan Afghanistan Coordination Cell (PACC). 13. "AFPAK Hand Director makes a difference", Defense Language Institute, September 30, 2011. An online news article about Capt James Muir, the Afghanistan/ Pakistan (AFPAK) Hands program manager in Afghanistan. 14. "Rethinking Civilian Assistance in Afghanistan", By Desaix Myers, The New York Times. Myers suggests the development of "expeditionary" civilians similar to the AfPak Hands program. 15. "Wraps come off special operations Afghan war plan", by Kimberly Dozier, U.S. News & World Report, April 12, 2012. The integration of the AfPak Hands program and the Village Stability Operations program is seen as a way of keeping the ANSF viable even as U.S. troops scale down operations and withdraw from Afghanistan.